This is the page for the old version 1. There is a Sound 2 Light V2 here. 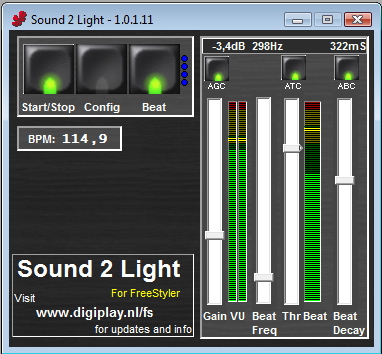 Welcome to the FreeStyler Sound 2 Light plugin page. Freestyler is free DMX lighting control software used by many leading dj's, venues and lighting designers and supported by a vast network of users worldwide. S2L is the plugin you can use to let your lights trigger by sound. Is the free 'beat detector' for FreeStyler and it is included in the FreeStyler setup. It records the audio from your favorite selected soundcard, analyzes the audio and calculates where the beats are. Those beat moments are sent to FreeStyler for nice light shows. With every beat you can make FreeStyler to go to the next step in a sequence or make a light flashing. We have implemented a beat divider, so sou can send one beat signal to FreeStyler after 2 (or 3 or more) beats. There's also an opposite of that, the beat multiplier. One beat from your audio signal, results in 2 (or 3 or more) beat signals that are sent to FreeStyler. SL.exe gets installed in the path where you installed FreeStyler.exe. Once you activate the sound 2 light feature in FreeStyler, this Sound 2 Light application launches and off you go! After you started the the beat detection, FreeStyler receives the beat signals from Sound 2 Light and does with it what it needs to do. Yes. It is free for use with FreeStyler. Just download and use it, together with FreeStyler. If you are looking for the original FreeStyler website, go to www.freestylerdmx.be. If you are looking for FreeStyler support, go to www.freestylersupport.com. See also the S2L FreeStyler Wiki page: www.freestylersupport.com/wiki/sound_2_light. Sound 2 Light is provided as-is. Digiplay.nl aims to provide S2L as good as possible. Digiplay.nl (the developer, and distributor) cannot be held responsible for any damage or problems you might run into. You and you alone are responsible for that. Every once in a while we receive e-mails from various people asking us they can use this Sound 2 Light app for their own home-brew products, other than FreeStyler. We even received questions from a few (some big) software and hardware fixture brands to get involved with them. While we are really happy with people and companies wanting to do that, we initially let them know we are willing to work with them, but unlike our work for FreeStyler we won't do that for free and will be asking a market-based fee depending on the situation. Just use it with FreeStyler. Then its free. [NEW] Auto start option in config. This is a sum of all beta release notes to 1.0.0.10. See beta release notes below.